Well might you ask! Fig. 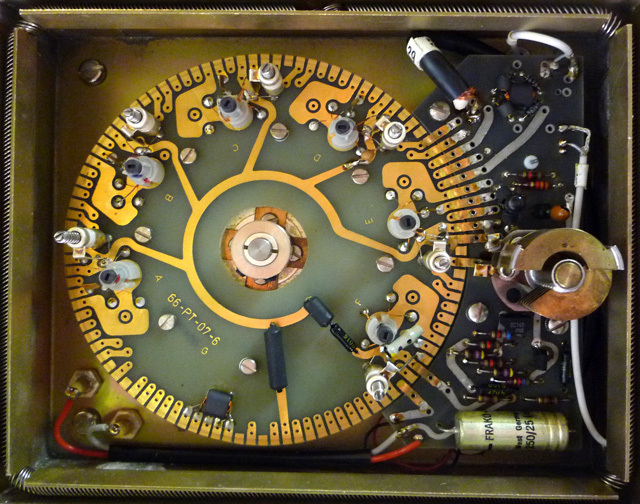 1 illustrates the rotary coil turret inside the RF front-end compartment of a Radiometer Model AFM2 Modulation Meter. The coils and trimmers are adjusted to calibrate the tuning dial; there is one pair per range. Turning the bandswitch rotates the turret , switching in the LO tank corresponding to the selected frequency range. The air-variable capacitor to the right of the turret is the instrument's main tuning capacitor. Verily a thing of beauty. Fig. 1: The RF tuner of the Radiometer AFM2 modulation meter.